Flo V. Menninger (Mrs. C. F. Menninger) organized and taught a Bible class and art class. These photographs show some of the students. The course she developed, "Four Years Through the Bible," has been taught continuously since that time. She also wrote a book published in 1939 "Days of My Life : Memories of a Kansas Mother and Teacher". 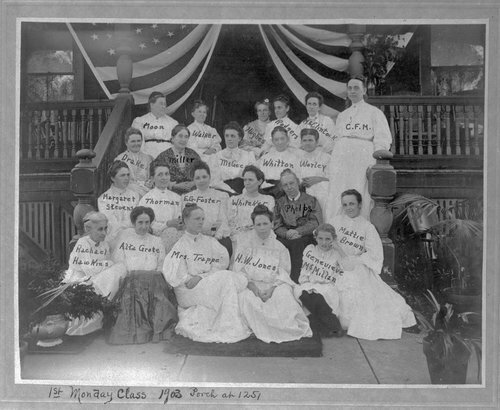 Menninger Bible and art classes - This photograph shows the women in Mrs. C. F. Menninger's 1903 Monday Bible class. They are on the porch of her home at 1251 Topeka Avenue. She is the woman standing marked C. F. M.